This is from Emma Cowan’s article on Christmas, “‘Tis the season”, in the latest issue #8 of World Sweet World. We forgot to put the amount of flour in the ingredients list, sorry about that, so here’s the whole recipe. 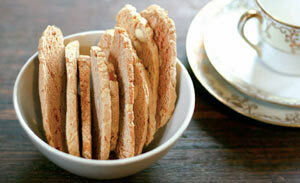 These snappy biscuits are easy to make; they just take a little time. You bake the dough first, in little log shapes, then slice it thinly and bake it again. This recipe makes around 60. 2. Beat the eggs with the sugar until pale and thick. Add the flour and baking powder, mix together, then divide the dough into two bowls. 3. Add the grated zest of an orange and the almonds to one bowl, and knead until the ingredients are combined and the dough is smooth. Add the cocoa and spices to the other bowl, mix through and then add the chocolate, kneading until combined. 4. Form each bowl of dough into two log shapes, then place on a baking tray with plenty of space between them. Bake them for 25 minutes, then remove to a cooling rack to cool completely (at least an hour). 6. With a sharp knife, cut the logs into 1/2cm slices, then lay them out on a baking tray. Slice on an angle to make long thin shapes. 7. Bake for 15-20 minutes, until the biscotti are dry and just starting to brown. Remove and leave to cool on a rack. They will continue to harden as they cool. Tuesday, December 8th, 2009 at 3:12 am. Filed under Content from the magazine, Projects & ideas. Follow comments (RSS 2.0), comment, or trackback. In the middle of making the biscotti and I panicked about the flour. Thanks for putting the flour amount up! … now, back to baking, having added the recipe (corrected) to my off-line digital recipe book. Haha, I did the same thing! I searched the internet and ended up using 4 cups just like it says above. The biscottis are really yummy, will make them again!